Moullinex (now spealt with two l’s) is the moniker of Dj/producer/composer Luis Clara Gomes, who is originally from Viseu, a small countryside town in Portugal, but now based in Munich. Ever since his first productions started being released, he has received scores of remix requests by such artists as Sebastien Tellier, Cut Copy, Who Made Who or Two Door Cinema Club, and labels such as Kitsuné, Modular or Compost. Between worldwide touring and constant studio work – and while refusing to give up a career in neurology and astronomy research – he also helped to found Discotexas, a record label and collective of artists from sunny Lisbon. Discotexas has just released the Forbidden Cuts EP featuring Moullinex, Xinobi and Rockets (download it for free HERE). 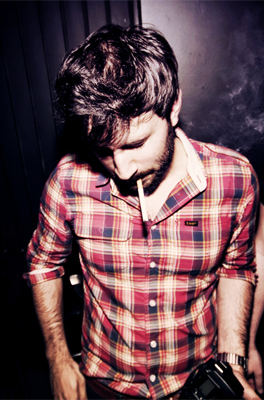 In 2009 Moullinex signed to Gomma Records, for which he is recording a full-length album. His first LP should be out in spring! On this album he is on a perpetual quest to avoid repetition of what he’s done before and this is why Luis invited friends to join his ranks. They helped him in shaping a sound always infused with eclecticism and also developed a live show, where fresh tracks are taken to a whole new level of interaction. I had never heard the Moullinex version of “Lights and Music” and didn’t think anything could surpass the Boys Noize mix but this is fantastic… Gives it some oomph 🙂 His “Lover in Me” track is awesome too – thanks for the link to Discotexas!